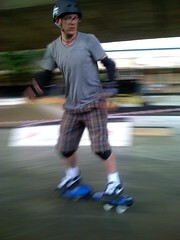 Happy Birthday Paul, long may you roll! Have a wicked birthday! I set mine up last night! I think this will be a good ride for Norski when he is all mended. Until then, I will have my fun! All I need is one more rear GOG! Hurry Donny, get them done! 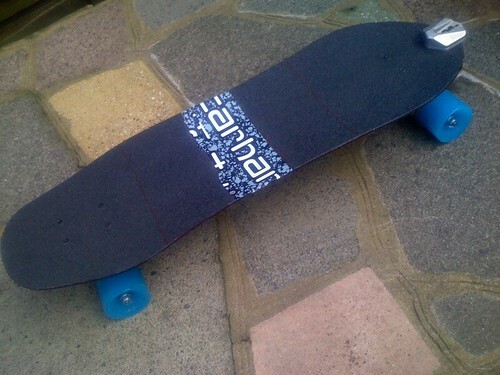 Hope you are enjoying the deck, the set up is easy, wedge the trucks as normal (extra at the front, de-wedge at the rear, keep the board level at the centre and use enough risers so you don't get wheel bite! Thanks Paul. I managed to set it up eventually, with some help from Dave Rogers. What I initially meant was that I was worried to tighten to much, and wreck the holes. It turned out that if you use your brains, you will manage just fine, hehe. We just had a race at Wasteland in London and there was a good turn out of Roadster owners! Thanks to Don and the Pavel crew for setting up the Gog race. I was very pleased to be on the podium again in the Pro Special and Pro tight races. The level of racing is insane and you need be 100% to be in with a chance. 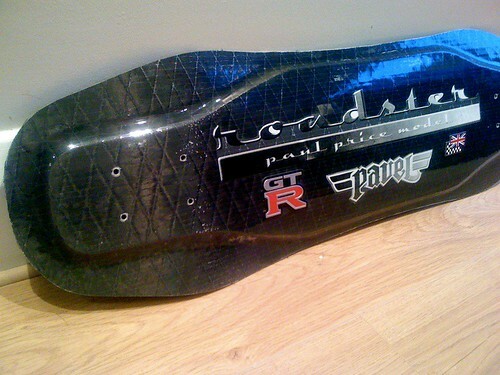 I got to pick up the new evolution design wide- tail Pavel 'Paul Price Model' Roadster GT-R.
Look for it coming to a race near you soon! Also Bish asked about the new Roadster GT-R, I will continue testing it and give feed back to the team at Pavel who will incorporate my suggestions so that the board will be ready for sale by the summer! At the moment it feels pretty good, and the wider tail does help in some courses. Finally got to set up the new wide-tail Roadster with some new GOG trucks and Seismic wheels. The concave is a little more deep and the room at the tail feels great! Here are some pics. Really cool to be able to follow the developement from the first page to now, wicked! The new wide-tail concept for the Roadster really seems to work well with increased power. 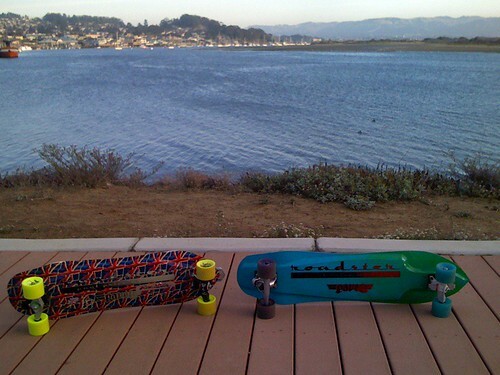 I took a 3rd in the Hybrid and a 4th in the Tight at the US Nationals at Morro Bay. on Fox Sports Channel from 17th August 2008. I am now packing to go to the Worlds in Sweden tomorrow, Sweeet! Last week there was a TV show recording for a weekly prime time show called "The Gadget show". It was filmed at Bay66 skatepark, London. 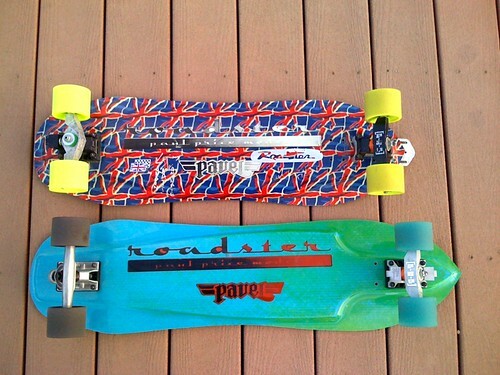 They tested the Pavel Roadster amongst 15 skateboards (including long-boards, snakeboards, electric boards etc) to find the top five skateboards. How did it do against the competition? You will have to wait until October when it goes to air on National TV. In the mean time keep a look out for my kuro black Roadster (350z logo) with silver GOG trucks and Blue Hotspots. 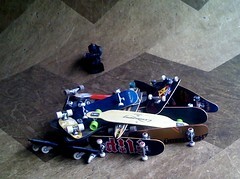 It was stolen from the stack of 15 different boards. Obviously the most desirable board to the street urchins. BUT I WANT IT BACK! 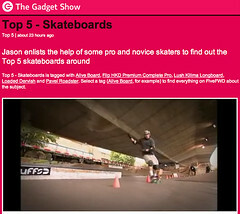 On Monday the Gadget show on channel 5 will be testing 15 skateboards and ranking the top 5. 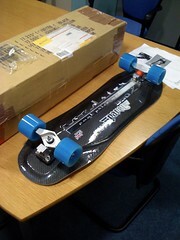 Will a slalom board do well in the testing? 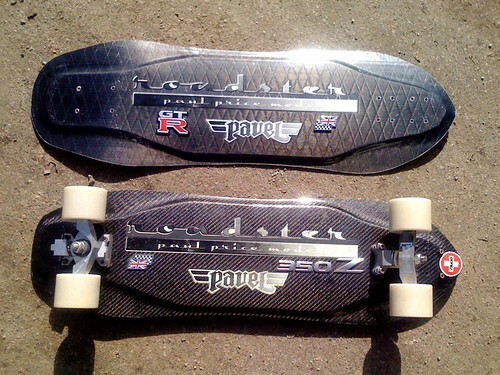 We rode the Pavel Roadster, in slalom and in the halfpipe, thanks to the kick-tail. 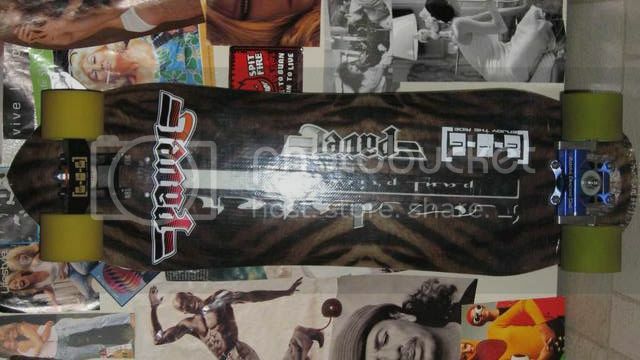 The original board was stolen and is still at large. Donald sent over a replacement for further testing double quick. 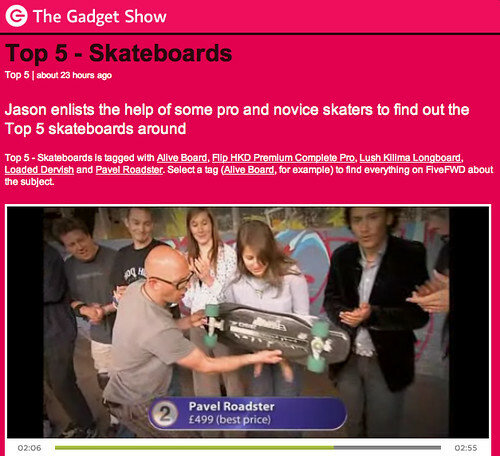 Just saw the Gadget show top 5 skateboards test on national TV. Thanks to Rob for joining me on the Gadget show testing team. 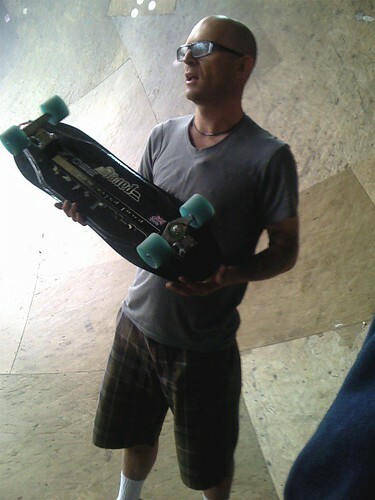 Trying out all the boards was fun. Having some slalom on prime time TV may get some people skating! Well done, Paul--good PR! The praise for your board sounded more enthusiastic than most. I cut out the good part of the episode. 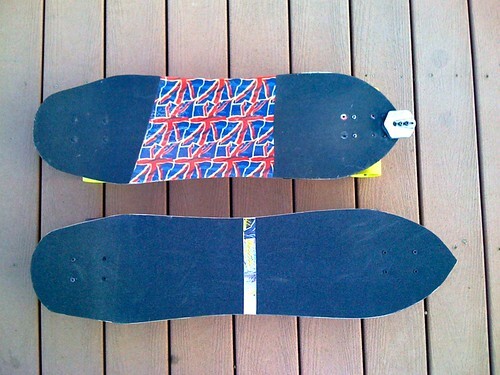 Is it just the graphic that is inspired by the 350Z or the shape of the board? Is it the same shape on every Pavel Roadster? 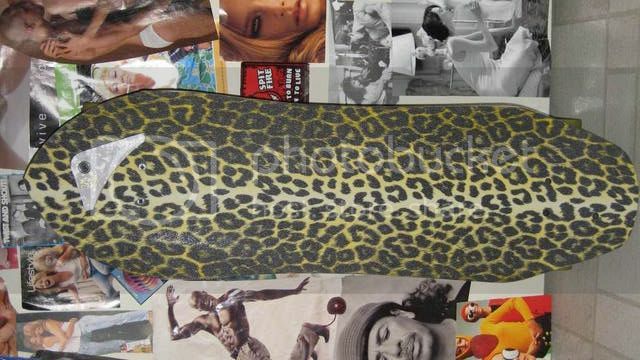 When I had the idea for a new slalom board in 2002 I wanted it to be inspired by a car shape rather than the surfboard shaped boards around at the time. 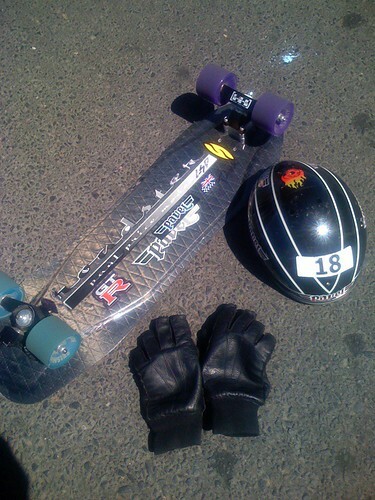 I called it the roadster because that was the type of board I wanted, a light, fast, fun board to ride like a convertible roadster car. A major part of it was to have the flared wheel arches (concave) and wide tail so as to put the power down in pumping tight courses. The roadster badge was added to the board to make it more car-like, like the silver badge on the rear of most cars. The Union Jack and chequered flag badge is from the MG. The 350Z badge looked cool and matched my ride at the time. The latest boards have the GT-R badge to reference the latest super car. Check the earlier posts in this thread to see the evolution of the design. 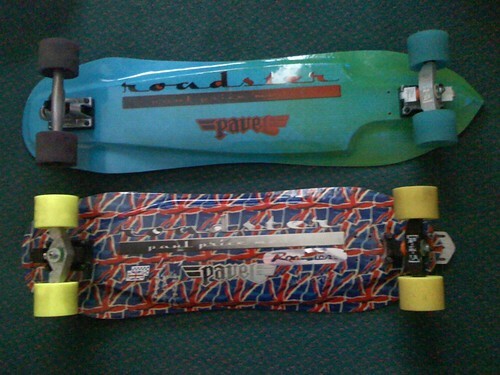 The latest boards have a wider tail to make the board more versatile. Just got my Roadster from Pelle Plast here in Sweden. Looks like a nice board there Adam. 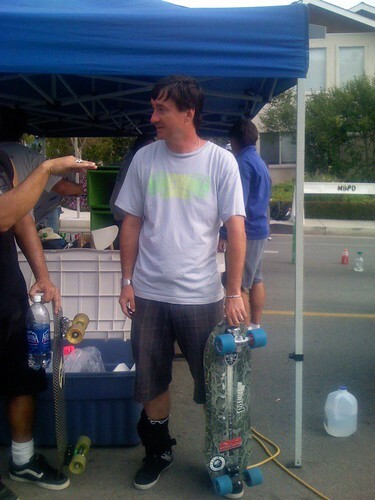 What trucks and wheels are you using? Currently I have GOG trucks and Seismic wheels. I just finished the US Nationals in Colorado and was stoked with a 5th in the Tight Slalom! 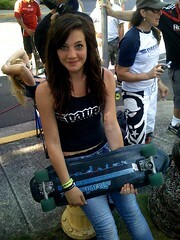 Congratulations to Ella for her 2nd place at the World Championships of Slalom Skateboarding at Hood River, Oregon riding her Roadster! 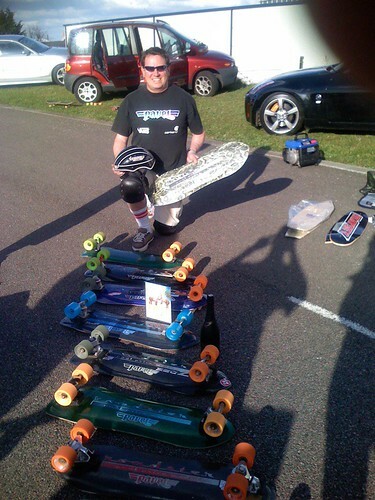 I got a 5th place in the Pro Slalom Tight on my wide-tail Roadster which was fantastic. 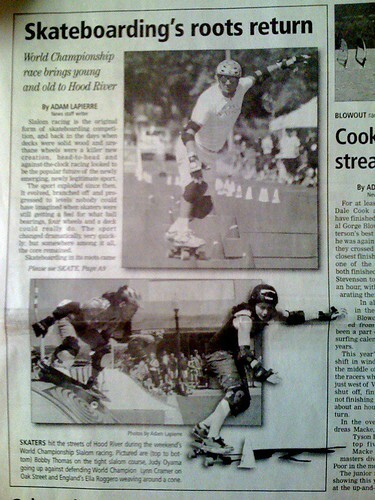 Ella got into the Hood River newspaper riding her Pavel Roadster! "England's Ella Roggero swerving around a cone"
Happy Birthday to Paul Price, designer of one of my 2 favourite slalom boards ;-) ,have a great birthday...see you at the Bar! Here is the new Pavel GS Roadster, 35 inches of speed, for when you feel like you need a few extra inches to really satisfy that wide open course. 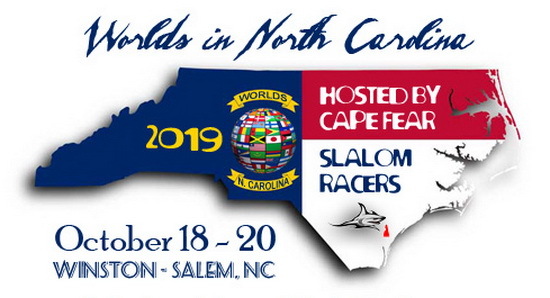 Coming to a Giant slalom race near you soon! Damn, I just bought a DK GS. 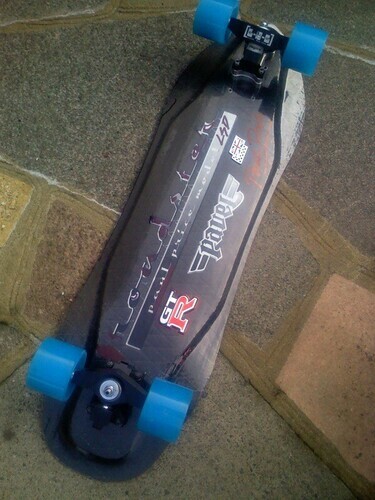 Nice looking board Paul. Sure to do some damage. Thanks, I am pleased with it. 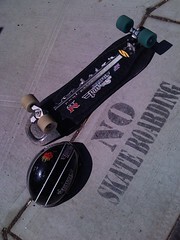 I am snowboarding lots this winter but will be ready to use it at competitions in 2011. If you decide to use the strong Aussie dollar to come snowboarding check us out. Get ready for some Rad new developments with the Roadster slalom deck!